R30 spin class will make you feel better in only 30 minutes. Just hop on the bike and begin to ride in this exercise spin class serving Springfield and Eugene. Motivational music along side inspiring fitness coaches will guide you into shedding pounds, improving stamina, and at the same time building cardio fitness as you cycle along with various surges, short intervals, power, and end with a rush. Find our gyms near you and FINISH FIRST AT PURSUE FITNESS! WHAT WILL I DO IN THIS SPIN CLASS? Warm-Up – Familiar music will start to play as your begin your smooth ride on the spin bike. An easy pace will get you spinning along with legs cycling and the body warming. Surge – Now the real workout begins as the sweat starts to flow. The intensity of the music picks up and so does the workout. Resistance starts to increase, the legs begin to move faster, and the heart rate begins pumping in this spinning class. Endurance – No guts, no glory as you shift in to a more difficult gear. The pace comes down as the resistance goes up focusing on strength and burning calories. This difficult portion for the spinning class gives you results. Short Intervals – Everybody loves intervals! Short bursts of intensity are each followed by recovery periods. If you are looking to improve your cardio fitness, you came to the right gym. Each interval is a chance to give it your all and reach your fitness goals. Power – This is the highest resistance stage so far. Climbing uphill will build stronger legs and burn extra calories. Enjoy the music as you are heading towards the finish line. Rush – Almost there! The finish line is within reach so dig down deep and show the other people from Springfield and Eugene what you got! When you make the final sprint in this spin class, EVERYONE FINISHES FIRST! Recover – Finally, the recovery period. Slow down, steady the heart rate and stretch out your body. Your 30 minutes of this group fitness class are complete! IS THIS SPIN CLASS FOR ME? 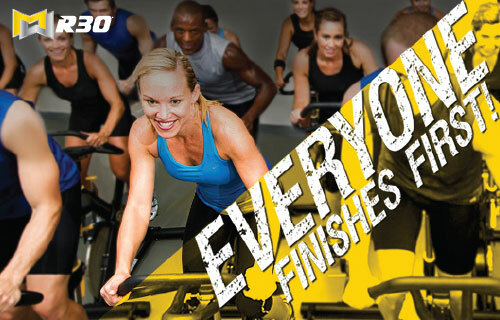 R30 spinning class is for everyone! You get out what you put in to R30 so it does not matter whether you are a beginner just starting an exercise program or have been cycling for years. This spin class is only 30 minutes with a very easy to follow format. With easily adjustable bikes you are in control of your comfort, pace, and resistance. A perfect lunch time exercise workout for anyone in Springfield or Eugene!